Boat Story has not been tagged yet. Help others find Boat Story by tagging it! 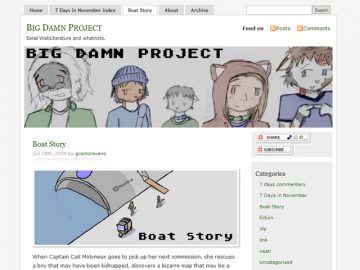 Boat Story follows the adventures of Cait, Captain of The Rose. There are only 9 parts up, and, while off to a slow start, there are already several developing plot lines which seem interesting, amongst which: an evil killer pirate hunting for a map, a mysterious boy whom Cait rescues, and of course the tangled relationships between the crew of The Rose. Boat Story has not been recommended yet.